Stories Of Wartime, Transformed Through Music Tortured and imprisoned under Saddam Hussein's regime, composer and oud player Rahim Alhaj — who resettled as a refugee in New Mexico — uses his work to tell true stories of Iraqis living through war. 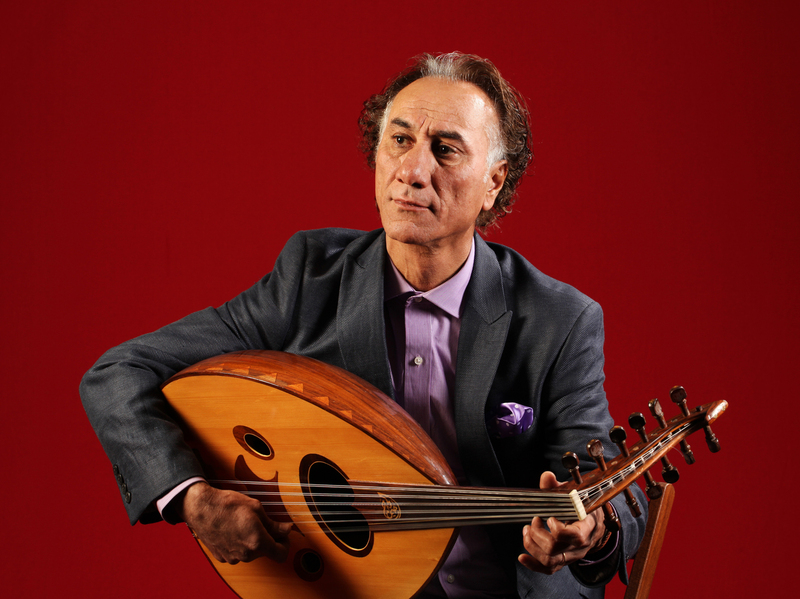 Iraqi-born, New Mexico-based composer and oud player Rahim Alhaj. In 2008, Alhaj became a U.S. citizen, and by 2015, he was given this country's highest prize for traditional and folk artists, the National Heritage Fellowship from the National Endowment for the Arts. But Alhaj has never left his culture — and music — behind. Rahim Alhaj plays a stringed instrument called the oud — the ancient, Middle Eastern precursor to what eventually became the guitar. On the album Letters from Iraq, Alhaj uses his oud, string quintet and percussion to turn letters written by Iraqis living through war into music. One, from his nephew, Fuad, was about going to get a haircut. "There was a car bombing, happened near the barbershop," Alhaj explains. Most of the people ran when they heard the explosion. But Fuad couldn't — he has a disability and can't walk well, or run. "Everyone's crying and body parts around him and he's scared," Alhaj says. "I was in tears. It was just a very moving story." Rahim Alhaj told his nephew he wanted to turn the boy's horror into music. "I told him, 'Hey, Fuad, I'm composing your letters.' And he was, 'Can I hear it?' So I tried to give it to him, and he started crying and said, 'Can I bring my friend, so we can hear it together?' Wow, how beautiful is that? He felt like he a human being and he's valued. You know, he's something in this world that is not negative and just disabled kid. Nobody give attention to him. And he felt like his life is matter. Like anybody else." Alhaj believes that in telling these stories through music, he can transcend the barriers of language and culture. "I remember one time they asked me, 'Rahim, how could you translate these letters to notes instead of language?' So I said this exactly: When I speak it in Arabic, you don't understand it, but if I talk to it emotionally, you grasp the meaning of it. And that's why I present it and translate it to note versus language." Still, Alhaj says that certain facets of life have been lost after his exile. For one thing, the city of his youth no longer exists, though he says that the specter of oppression still hangs over the metropolis. "When I went back to Baghdad," he says, "I felt something missing here, this is not the same Baghdad that I was living in ... But I find there's a different regime who has control the Iraqi people, and they are the same — same goal and the same purpose of being." Alhaj's newest album, One Sky, deals with another brutal period in Iraq's recent history: the Iran-Iraq war that devastated both countries in the 1980s. (Depending on estimates, between 500,000 and 1.5 million people are thought to have died in the eight-year conflict.) For this project, Alhaj collaborated with the Iranian santour hammered dulcimer player Sourena Sefati and a Palestinian-American percussionist, Issa Malluf. Alhaj was trained as a violinist as well as an oud player in what was once the greatest city in the world to study the oud — Baghdad, says Hicham Chami, an an ethnomusicologist working on a doctorate at Columbia University. He's also a musician, and a specialist in Iraqi music. Out of two thousand applicants, Alhaj won one of five highly coveted spots at Baghdad's music conservatory to train with Munir Bashir, one of the world's foremost oud players. "Here is someone who studied and performed at length with Bashir, who is probably the best oud player who ever existed," says Chami. That is to say, Rahim Alhaj could play super-virtuosically — if he wanted to. Chami contends that Alhaj has made a conscious decision to create more accessible music for a mainstream audience. "He works with the string quartet or a quintet, maybe in a very clichéd way," Chami says, "and ends up volleying back and forth between the oud and the string quartet, modulating on each iteration, passing the melody back and forth. His melodies are very simple." "And yet," Chami observes, "one could also argue that music doesn't need to be complex in order to be beautiful." Rahim Alhaj says that simplicity was a vehicle. "To be honest I was really not to showing off how virtuosic I am for this record. I wanted to tell the story. I promised myself to be the voice for the voiceless people... to tell them to please hear our voice, to please give us a chance to tell you the story of what happened here, because you ... never heard that in the radio, you never saw it on TV. Please give me a chance to explain what's going on." Each individual story is one more step in Rahim Alhaj's long journey to transform the chaos and pain of war into beauty.